The CROS-ARC MMA200S is a 230V D.C Inverter based power source incorporating full electronic amperage control and digital amp meter. 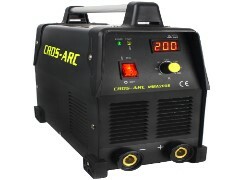 It is the perfect solution for applications where a high welding output and portability are required. This welder will also weld Aluminium with our Aluminium electrodes PP13507.